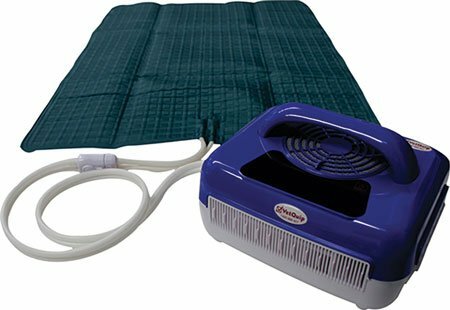 This is a mat that has warm water pumped through it. It can be placed over or below an animal to keep it warm while it’s under anaesthetic. Likewise, it can be filled with cool water to help an animal suffering from heat stroke. It’s common for animals to get quite cold while undergoing anaesthetic. We pre-warm our patients prior to their procedure and continue once they are anaesthetised. If we can keep their temperature constant, they recover better from the anaesthetic. It also helps maintain an even blood pressure. It comes with a small and large mat that is suitable for most breeds of cats and dogs. The big mat can also be used to wrap around a small animal and that works very effectively. We use it for all our anaesthetic patients and I have noticed a real improvement in recovery since employing the mat. We use it in combination with multimodal treatment options for warming, but it’s definitely one of the main components. It’s very simple to use and requires little maintenance. There is a small unit that’s filled with water that also heats and pumps the water through the mat. It maintains a temperature of 44 degrees. You simply need to keep an eye on the water level and drain it properly once you’re finished. There are also air-warming mats on the market but I believe water mats are more effective. They hold the heat better and air mats have a higher risk of infection with all that air blowing around. As it’s a water-filled mat, there is the possibility of a tear from a scrambling animal. We found a glue that seals it very easily, so if it does tear, you don’t have to throw it away; it’s repairable.